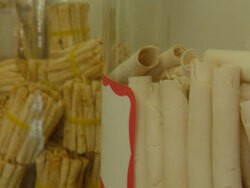 For the initial appointment you will have a complete evaluation of your physical condition according to the practices of TCM. You will be asked a number of questions about current or past treatments, medical history, diet, bodily functions, medications, emotion and lifestyle. Your doctor will make a diagnosis, give you a course of treatment, and fully describe the nature and combination of therapies that you might expect over the course of treatment. The clinical approach at this centre will be carefully designed to be complementary to any other ongoing treatment provided that you inform your doctor of any current treatments and/or medication. The approach in TCM is typically very individual and your condition will be most effectively addressed with your cooperation and ongoing communication with your doctor. Herbs are used extensively in Chinese medicine and contrary to the commonly acute effects of western prescriptions, the combination of herbs which generally have gradual yet effective results. The prescriptions may come in a variety of forms such as tea, tablets, etc. which treat the body as a whole, concentrating on re-establishing the balance between the Yin and Yang of the body. There are generally few side effects with an experienced and qualified doctor if you follow instructions as indicated. i. The points are used for both diagnosis and treatment of the functioning of internal organs and body systems. ii. Stimulating the points improves and promotes healing of the body's complex internal systems. The experienced acupuncturist will strategically place the needles along the 14 meridians in specific recognized points of healing. The needles are placed to address your particular problem or condition. Insertion is typically painless and fine energetic sensation may be felt. It is often reported following acupuncture that there is a feeling of well being and there may be other health benefit that you may notice overall. Acupuncture is most effective for general therapeutic purposes and for treating many common diseases. 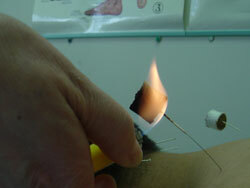 Moxibustion treats and prevents diseases by burning the herb called Moxa to apply heat to acupoints. It has the properties of warming and removing blockage of the energy channels, eliminating coldness and dampness and thus promoting normal functioning of the organs. Its heat is mild and at the same time penetrates deep beneath the skin, giving a sensation of comfort. Cupping is a therapy in which a jar is attached to the skin surface to cause local congestion through the removal of the air in the jar created by introducing heat in the form of an ignited material. This method has the function of warming and promoting the energy flow(Qi) and blood flow in the channels, diminishing swellings and pains, dispelling cold and dampness. Chinese Massage or "Tui Na" is a type of therapy which is most effective in the treatment of muscular disorders and joint problems. Using various movements and degrees of pressure on the body surface at energetic points and channels can loosen adhesion, mobilize joints, and enhance general health and healing processes of the body. Tui Na is recognized as a very effective treatment for patients experiencing pain. 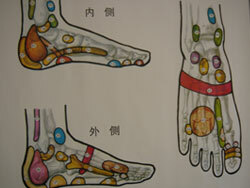 Reflexology works the reflexes in the feet, which correspond to all the glands, organs and other parts of the body. By working certain points or reflexes in the foot, the client can be relieved of blockages and discomfort. Circulation and elimination are both enhanced. For further information or advice on any aspect of TCM, please feel free to contact us.